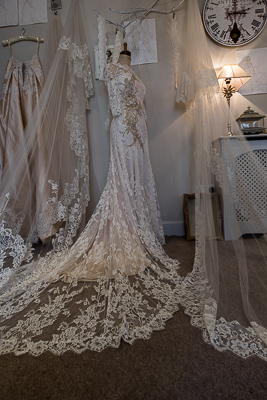 Imagine the most beautiful handmade bespoke wedding dress, like something out of a dream that no one else would have. Designed and created for you on your wedding day, beautifully hand stitched with lace and all the trimmings… well imagine no more! Just around the corner from where we are based, is the amazingly talented Adam Shaw. Adam’s shop is in Lindley and after twelve months of trading is going from strength to strength. Ben and I popped in to see Adam last week to discuss how and if we could compliment each others business. I have to say we were both taken a back by the incredible work Adam does. 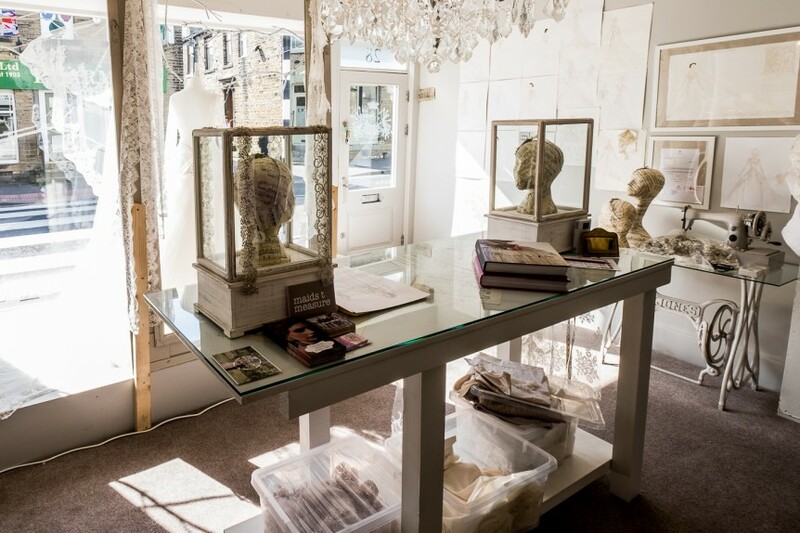 The front of the shop is where he meets and greets his customers and is beautifully designed with a music sheet theme to carry you off into a classical world of beauty. 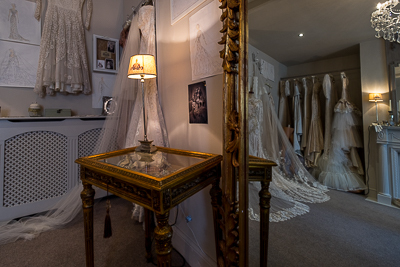 Beyond the door to the back of the shop, you are immediately breath taken by the sheer elegance and beauty of the dresses Adam has on show. Because Adam designs and makes his own dresses, unlike an off the shelf commercial shop, there are only a dozen or so dresses on display. As Adam explained the idea is to see the materials, the lace and all the extras you might want to go with your dress. 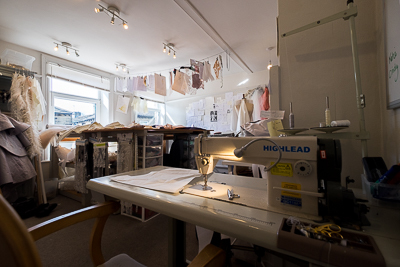 After we finish exploring the back of the shop, we need to go upstairs…….this is where the magic of dress making begins. 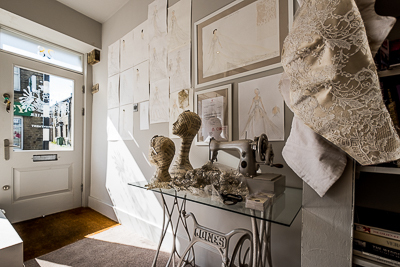 Upstairs is where the creative genius sets to work and as you would expect there is a large dress making table, sewing machines and delicate sketches all over the walls. Adam clearly doesn’t have time to waste. 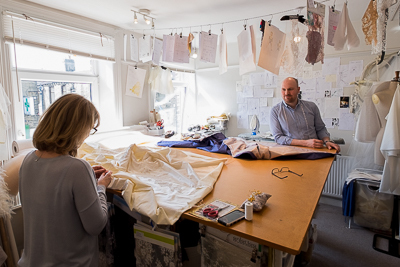 If he’s not sat at his sewing machine, discussing designs with a customer, answering the phone or making alterations he’s probably at home asleep. However this busy fast paced life is just what keeps him going. Oh and did I mention he is a dressmaker to the stars!! 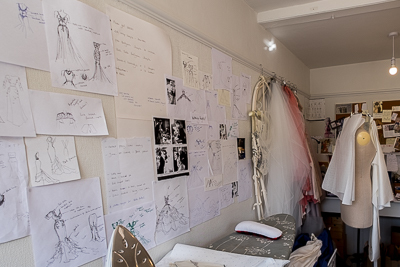 He designed and made a dress for Maxine Peake to wear at the BAFTA TV awards, a gown for Emmerdale’s Fiona Wade and a dress for Emma Williams for the Olivier Awards. So if you want to follow in the footsteps of the rich and famous, get down to Adam’s shop at 28 Lidget Street Lindley Huddersfield HD33JP or call on 07858 960845 and see what he can dream up for you. If you want to contact Adam you can go to his Facebook page Adam Shaw Couture or contact me here for more information. 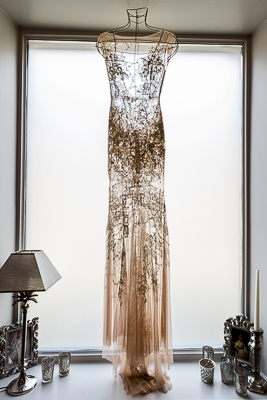 Oh, and if you buy one of Adam’s dresses I would love to be your wedding photographer…..